Train Fever is about transporting people and freight. In this development update, we show what can be transported, and explain from where to where. In addition, we present how the game world is simulated and explain what a town needs in order to grow and develop. 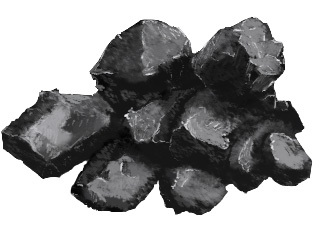 Raw materials (coal, wood, iron ore and oil) are mined at several locations in the game world. 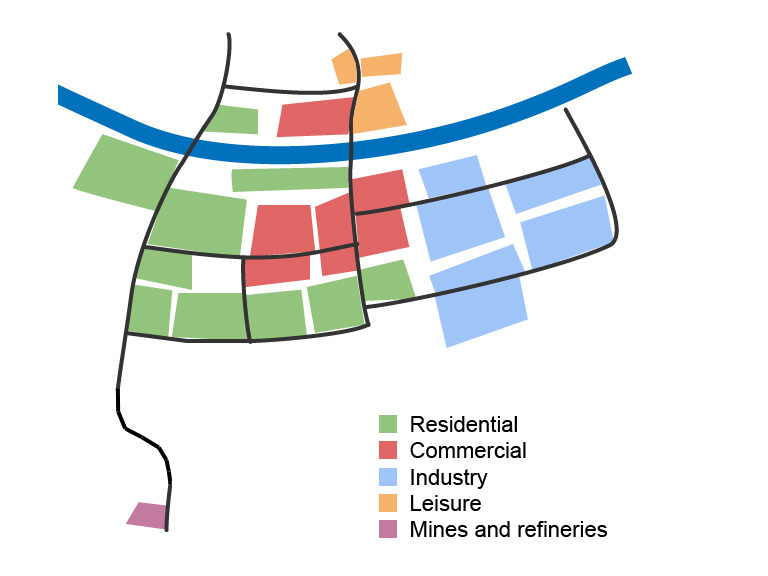 Mines and refineries are typically located outside of towns. The raw materials are required by industry buildings, typically located inside of or close to towns. If industry buildings also get enough people (employees), then goods are produced. Goods are then sent to commercial buildings, which will finally sell them to people. People not only want to buy goods in commercial buildings, they also want to go to work and have some recreation time (leisure, parks and attractions). 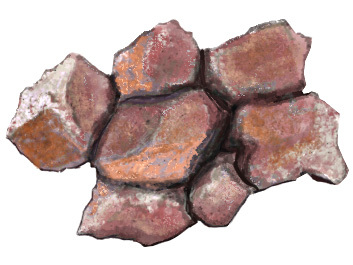 The game world can include up to 25 towns and even more mines and refineries. Most industries do only need a selection of raw materials. 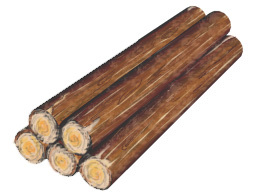 For instance, a furniture industry primarily needs wood. So far we have explained the basic movement of people and freight. Let’s get a more detailed view. People look for work places, commercial districts and recreation destinations. 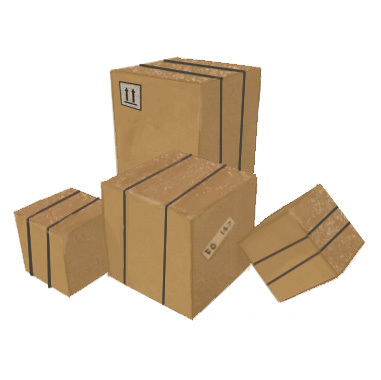 Freight items are sent by the producer to a destination which requires the respective item. In both cases the destination is chosen randomly within a certain maximal travelling time. The faster a destination is reachable, the more likely the destination is chosen. Once a destination is chosen, the person or freight item is transported on the fastest way to this destination. Of course, people and freight can change transportation vehicles and can be temporarily stored at stations on the way to the destination. A player can be successful and earn money by constructing efficient transportation lines which fulfill the movement demands of people and freight. The faster the transportation vehicles and the higher the frequency, the more items will be transported with your lines. Note that if you don’t construct or if your transport infrastructure is not efficient enough, the world will not stop to move! People will walk or use their cars. Mines, refineries and industries will transport their items by their own (manually or by using trucks). Of course, you can speed up growth and development by taking action. 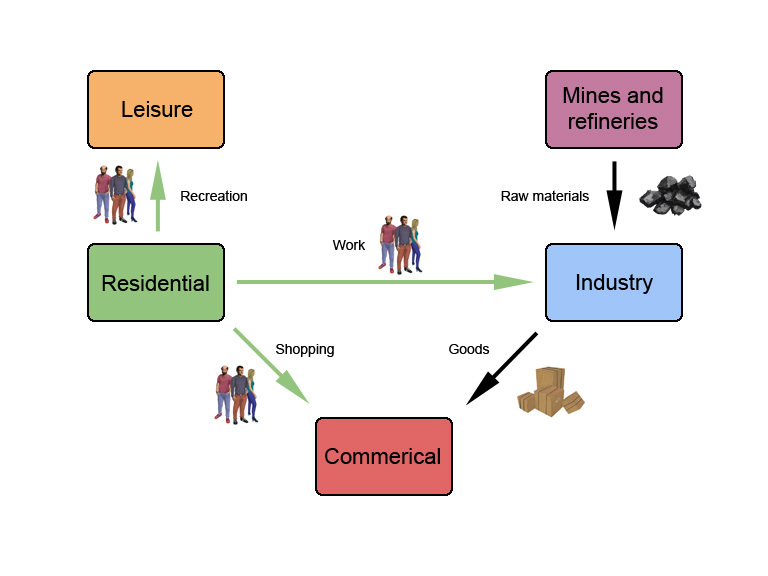 This brings us to the last topic: When will towns grow and industries increase production? We have designed a simple but also quite realistic economy model. Thanks to its simplicity the game will be fun to play. And because of the realistic movement of items and impact on town growth there is a quite high complexity and depth of simulation at the same time. You may have noticed that public and freight transport are connected in this model. For instance, delivering more raw materials to industries will let industries grow and will also make well-accessible residential districts more attractive. In a future update we will go into more details and we will also present the respective buildings (residential, commercial, industrial, leisure, mines and refineries). Update: Thanks in advance for your feedback, questions and criticism. As usual, we will answer the most important questions a few days later (this weekend) in a Q&A post. Update: Please find a Q&A post here. Amazing! I especially like how there are only 4 raw materials; It makes it seem simple yet fun. Thanks for the update. I think you meant “the bigger/longer the transportation vehicles”, not the faster. Speed doesn’t change capacity of a system if the frequency remains the same. It might be a measure of the attractiveness of a connection. Assuming that the capacity is not always used to its full extent. Which would indeed add an interesting economic dimension to the game. Capacity does not change, but attractiveness does change, so industries are more eager to send their production through the fastest transportation available. It is not that your network is able to transport more, but that industries bring more products to your station for transportation. At least this is how I understand this. “the more items will be transported with your lines” suggests to me at least that it’s the capacity of the lines that is referred to. But you and wato are right that it can also be interpreted also as how attractive your lines are, and in that case the statement makes more sense. However the sentence is still confusing since it seems to point only to goods transport (transporting items), but line attractiveness derived from speed and frequency matters primary for passenger transport. For goods transport capacity and reliability is normally of much more interest then speed/frequency. I have just one question, how can we set the frequency of a line,if we won’t have schedules? I’m still thinking that it would be really useful for players an in-game option which allow to set how time pass,like in CiM2. Simulation game need to be fun,but (for me) also “realistic”! I think it should be pre-set or optional. But if it’s pre-set and you can change it afterwards, that’d be great. I was thinking about a system in which a second bus starts its route when the bus infront of it is 1/2 done with its route, a third bus starts when the second bus is 2/3 done with its route, a fourth bus starts whn the third bus is 3/4 done with its route, et cetera. Felix I am on your side, I really really want an game mode in realtime. The fast time running of one year in 6 minutes scares me, I don’t like it. It is only good for complicatet economic simulation where you only need a transportation from A to B, but in public transportation the time, the shedules, the micromanagement improves the game a lot. With a day and a nightcircle you can create great peak traffic in the morning or in the afternoot, with the running time of 2 Month per Minute, this is impossible. It is amazing that you can follow every citizen in TrainFever, but it is disgusting to see that they need Years to get to work. I hope you can follow my thoughts. It would be such a great improvement when there would be a parallel real time gamemode, in which the epochs are set and you are able to build you transportation network in a reasonably realistic time. So the tutorials weren’t very helpful, sure it explained the basics, but it doesn’t really tell you how to play the game properly. And besides that, it seemed that you needed to be an economic expert to play the game (also because of the lack of a good tutorial) That’s why I never really understood it. I also think CiM2 is easy, but it is far from realistic when a bus takes hours to do a few blocks !!! There is a ruleseteditor and you can adjust the time just like you want. With that, you get nearly realistic settings. Haha, very nice modern characters. I see Trevor and Michael from GTA V there. Is that intentional? No that was not my intention. I tried to get some variety in the hair-styles, but not something to fancy. Hahaha, yeah, they do look a bit like Micheal and Trevor! I like it that we won’t get overloaded with raw materials and products to transport. With the current system you can really focus on things instead of just making as many routes as possible. You need to use your brain with this system, not your in-game money. Anyway, are there more peds or are these the only one? It’d be pretty weird if we’d only see 3 people walking around in the district. But I think you guys should really make some trailers and more gameplay videos on Youtube, maybe even hand out beta’s to populair youtubers like OfficiallyNerdCubed for example. ‘Cause right now, you just aren’t very populair and I think this game really deserves a lot more attention. Good luck with further development, I get more exited about this game with every post! I agree, a lot of People don’t know of the existence of this game. Better to build hype closer to release. I think their strategy is sound. First test the game with a limited and dedicated group, once game has all the features and working satisfactory start build hype around 1 month before release. Handing out free beta copies to the most popular youtube streamers in similar game types like Simcity/CiM2 and so on is a great (and free) marketing strategy, but doing it to early risk the game being forgotten in time for release unless you can keep providing new info and keep the excitement up. And you do have a valiad point actually. The developpers don’t post a lot of stuff here, it’s not like we get an update every week. So people mid get bored of the project or just forget about it. But I hope the devs realize that Q2 isn’t far away. I like the simplicity of how they choose to go by private ways or use the player services. But I don’t like that there are only 4 raw materials + goods. If that will be at the launch, please consider adding more and more types of products later. Or add the possibility to easily mod the game so the community can add more stuff. Complex chains are good and motivating. Thanks for the update! Very promising stuff! Are you simulating personalities with a fixed residential- and workplace or are the destinations chosen randomly each time the person shows up in the game? Goods destinations on the other hand are probably more volatile, even in a realistic scenario. Very nice updates, I really like the detailed explanation of the mechanics togheter with concept art and in-game renders. Keep the updates coming, its great to follow the progress. For marketing, youtube is a great place for this, try to get hold of some of the biggest youtube reviewers (total biscuit, n3rd, etc), game channels. And approach them with the beta/alpha (when its ready). If they are not that interested, try offering them some money to review your game(this is very common, and aslong as you dont pay for a positive review, its all fine). There is always a chance they might review it negative, but as long as they are fair to the content, then there shouldnt be a problem. Thank you very much for this update! It was very interesting. About other goods: as I remember, earlier you talk about steel, corn and livestock – it still in game? Russian community very waiting for TF! 1. 25 cities on map – it great, but how large can be this cities? They have some limit, or we can to built megapolis? 2. If two cities located next to each other, they can to unite? 3. Will we be able to buy some manufactures, like in Railroads, for example? Do you have an idea of the release date yet? Will we be able to pre-order it? Will it be a boxed product or digital download only (I prefer boxed products in my hands)? Will there be a special collectors edition? Release will be in Q2 (likely in May). Great!! Really looking forward to it!! i only will buy it, if it has a LAN-Mode.. otherwise i keep playing TransportTycoon. nice to see something good growing. TF reached the community of Cim, where People like me started to lose belief in a community supported game. As I know the quite big crowd of transport management fans already since the 90′s we can encourage you to continue with your Project, because you have very promising ideas and ways to realize. This genre is waiting for a good follower of the classic games for many years now. Regarding your latest News, I like the idea of simple supply chains which can be later maybe increased, anyway starting with the simple cases. The characters are okay, as long as there is a broad variety. Having only a few characters will sometimes lead to “Zombie armies” of 2 and more of the same character on the same Screen. Keep fighting, Q2 is a challenge, as I saw, that certain things (goods) were implemented only some months ago. Ugh, Euclid-style zoning. Can you make it so that there are mixed areas that are more realistic? E.g. residential and retail shouldn’t always be separated, SimCity-style. Most real cities have them together, so that people can walk down the street to the shop (or even down the stairs). Deliveries are the interesting issue in that case. The simulation might even be able to naturally express the observation that people who live in dedicated residential zones will be more inclined to use their cars to get to work/leisure, whereas people who live in the mixed areas will be more inclined to walk or use transit. What about Grain goods from farms (Barley/Wheat)? Trucks drop them off at Silos and freight train can collect Grain goods. AI need beers you know. I was just wondering; what will the price of the game be on Steam in U.S. Dollars? I really think this freight modell is gonna be quite good. Not only because it is kept simple but also because the cities will also develop if we don’t offer them freight trains. I’m not a big fan of cargo transportation so I’m quite glad, it is realized that way. But to be honest, it would be nice to have food as freight too. It would mean grain/meat as a raw material and chilled goods as aditional cargo type. I guess this way most freight purposes would be covered. I mean most of the products made can be transported as goods in a box car and since they have destinations it’s even possible to have a transport chain. I’m not sure if it’s realized that way, but i guess it’s also possible that for example eclectronic chips are sent to another factory to proceed them to computers. And I personally don’t need a car factory in my region. But there is one quite important question for me when I think about small towns/villages near a track with a wood source for example. Will it be possible to set up freight trains with passenger cars? (De: Güterzug mit Personenbeförderung) I think that would be quite realistic and useful for the game play. I imagine for example a train with two wood cars, a good car and two passenger cars, which takes wood from this village to the industry and brings goods to this village. In the same train commuters can travel between those places. About the destinations of people: will the amount of work and leisure activities change over the years? I guess in 1850 people had to work a bit more than 8 hours a day. My first impression would be that industries work the other way around: the more products they sell, the more raw materials and employees they will require. So an industry should only grow if its production is successfully delivered: piles of unsold goods should prevent growth. kan man das spiel forbestelen dan hätet ihr zusäzliche einamen . As a long fan of Transport Tycoon and Railroad Tycoon I am really waiting for Train Fever, but I fear more and more that I will be disappointed. The economic model does not seem that realistic in a region with different cities. It might only be realistic in a region with few cities and suburbs… It must include some city-to-city transportation variables (biggest cities are passenger traffic attractors and dispatcher… one could easily imagine a sort of weighted system taking into account city dimension, distance and characteristics). As well the list of goods and the lack of industry chains (like coal + iron –> steel –> cars –> buyers) is really a gigantic step back in the evolution of the genre. However, what is really disappointing is the lack of competition with AI characters and competitive multiplayers. I really liked the last Railroads from Sid Meyer (apart from a few poor design choices with short tracks) ! It does not seem too difficult to implement. A skilled programmer could even take a look into open TTD to get a few good ideas. Hey, AI and multiplayer will be added in future, in DLC may be. For example, I really don’t need this, I just want good transport tycoon. >>It does not seem too difficult to implement. Well, may be, if you don’t know what is gamedev I’ll just say what it’s really don’t easy, and, moreover, for it need time. So at first – main thing – gameplay. At second – MP. Dont forget this is not EA with a lot of money. The first priority is to produce a working game with all the basic functions. @gc: what is your working way to produce “cars” for example? You have to find a compromise between complex industrie and easy managment. Not all of us have the time to read a instruction for playing the game. All rooted objections will be ok, but remember this is not a big publisher and a working release version is the A and O of this project. But this is a transport game You have no influence on the goods (for example sell price, quality, etc.) In fact you are right. But in this game the activator is not the quality of products. It is the quantity of (working) people. I’m looking at it purely from the transport perspective: an industry should not grow if its production is not / cannot be transported to final sales point. If all the production (or 90%, a reasonable big number) is transported, then the industry would look for more employees and raw materials, and if they are available (because they are also transported to the industry), then it should grow (=increase its production). It should be a fairly simple model, without any considerations of product quality or prices (we can assume the management of the industry does that non-transportation part properly so that goods are sold at the sales points). I know that the developer is not big, I am aware that programming an AI may not be simple and I completely understand economic pressure. I find personally that having the possibility of playing against an AI or other people is a lot more satisfying. I am not sure I would buy another CiM, but I would definitely buy another TTD. I think that a game with these features would sell a lot more. I just hope that the first release goes well to stimulate you to add these features in future releases. Anyway, I congratulate you for the courage of embarking in developing such a game. Is there any chance for early access on steam ? 1) Is it possible to deliver partial goods? Like in RRT2 I have a train full of coal and goods. It will deliver coal and next destination deliver goods. Or it will always unload 100% of the cargo in one simple destination? 2) Is it possible to deliver a cargo in one station that doesn’t demand it, for another train to pick it? Example: The route from one station to the coal mine is very far. There I will deliver employees and goods. The goods will then be loaded by another train that will deliver to cities. This is good to avoid train breaks when destination is too far. Why is the number of items transported dependent on the speed and frequency of a line? Higher speed and frequency make lines more attractive. Faster vehicles decrease travelling time. More frequency (more vehicles on a line) lead to lower average waiting time (or transfer time) at stations, and therefore make a connection more likely to be chosen by people and freight items. A higher frequency of course also increases the capacity of a line. How can we set the frequency of a line, if we won’t have schedules? The player can increase frequency on a particular line by using more or faster vehicles. Will vehicles drive in convoys? No. Vehicles automatically distribute in order to achieve equal distances in-between. They automatically wait at stations if the vehicle in front is too close. Are there only these nine pedestrians which are shown in the illustration? No. There will be more people / pedestrians. The image shown in the update is just an illustration. Are there only four raw materials and one goods type at release? We understand that many of you would like to see more raw materials and goods. This why we try to keep the implementation as generic and open as possible. 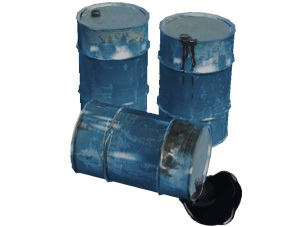 As a consequence, it should be possible to add more transport items to the game later (e.g. with a DLC, and it might also be possible with modding). Are you simulating people with a fixed residential and work place or are the destinations chosen randomly each time the person shows up in the game? Each time a person goes to work, shopping or leisure, a random destination within some maximal distance / traveling time is computed. At the moment, it’s randomly chosen each time, but it’s likely that we try to keep the working place constant at least (because in reality the working place stays constant for a long time). The residential place (home building) is constant of course. How large can cities get? Can two neighbor cities merge together? Cities grow in horizontal and vertical direction (more density). At the moment, the maximal horizontal size is limited, and two neighbor cities cannot merge. However, this is one of the open questions we currently still have, so I cannot give a final answer. Will we be able to buy some manufactures, like in Railroads, for example? Do you have an idea of the release date yet? Will we be able to pre-order it? Will it be a boxed product or digital download only? How much will it cost? The definitive release date will be announced soon. Pre-order will be possible for sure. At least in German-speaking countries the game will be available as a boxed product in retail stores. In any case, the game will be available world-wide for digital download (Steam). The price of the game will be about € 25. Can you make the cities so that there are mixed land use areas that are more realistic? Definitely, yes. The image in the update is just a schematic illustration. Will it be possible to set up freight trains with passenger cars? Yes, train cars be arbitrarily combined. Will the amount of work and leisure activities change over the years? We have been thinking about this. However, that’s one of the details we do not consider so far. Shouldn’t industries only grow if their production (goods) is successfully delivered? Unfortunately, the description of industry growth in the update is not precise enough. If an industry cannot sell / deliver any of its products, then it won’t grow of course. The growth of industries is also dependent on how many goods items they can sell / deliver to commercial buildings. Is there any chance for early access on Steam? There are no plans for early access or alpha funding. Is it possible to deliver partial goods or will a train always completely unload at a station? Each freight item has its own destination. Therefore, a train / train car can unload just a part of its freight. Is it possible to deliver a cargo in one station that doesn’t demand it, for another train to pick it? Yes, freight items can change vehicles multiple times. They can be temporarily stored at stations and can be picked up by other vehicles. However, the number of freight items which can be stored at a station is limited (this number depends on the size / type of the station). Basil, thank you very much for answers! About size of cities: I think, what from point of view of gameplay will be better if this limit will be relatively large: 3×3-4x4km, for example (it’s size of big city in CiM). In this case people who want to create in city public transport network will be able to do this: they will be able to create large tram routes, urban railways (S-bahn) metro (in future, I want to beleave ) and so on. Well it’s game _including_ city transport, I think you seen trams and city buses in previous update. This game about transport in general: intercity – trains and trucks (and may be airplanes in future? ), and city – trams and buses (and may be in future – trolleybuses and metro). As well as about the interaction of intercity and city public transport. So if you don’t wanna use city public transport – you can do it (you also can play in Transport Tycoon or Railroad Tycoon, or Railroads ), but a lot of features just make the game better. I think what one of the main features of Train Fever is union ideas of Transport Tycoon\RRT and Traffic Giant\CiM, so I’m wrong? Its a mix. Train for longer distance and big capacity. But what would you do to grow cities? Use bus, trams and metro, right. In my opinion it would also be better and more realistic if cities could merge. That’s what happened in the real world too, towns/villages which were 2, 3 km away from each other grew together to an agglomeration when there was enough traffic between them. I mean I don’t see the problem, in 1850 you connect those places with a railway line and as they start to grow over the years you add more stops for local trains or a connected bus network. I mean it’s good, when not all cities merge and there needs to be a really good connection and a quite close center to each other to make them merging. But I’d love to see a urban area with more than one municipality. It’s 50/50….this game is not pointed on city transport,but however they will include urban vehicles which are made for this. So,given this,it would be quite good if we could have the possibilities to manage not only trains and lines between cities ,but even lines inside them. And with lines i also mean a system that allow us to transport citizen to and out the railways stations. The bigger the city is the most fun you will have planning how to transport masses ,from local point of view and so on. I’m really glad to know that urban transport will be included in the game,and I also hope to see boundless cities (if necessary). I agree, the ability to create a city transport network would be awesome, and I would personally prefer this feature. However, a 3x3km limit might be too big for a player who wants to play only intercity transport, as it’s nearly 1/10 of the entire map area. It will be hard to have a one-size fits all city limit, as there are so many “ideal” sizes for the city limit. Would it be possible to implement a ruleset before each game that adjusts factors such as the city limit and number of cities? This feature can essentially combine two completely different games into one. Sorry, that I did the math wrong and double posted this correction. Sorry, I did the math wrong. It won’t be 1/10 of the area. What about Mail? Or will the road traffic handle that? So I set up my rail empire and have hopper trains bring coal and iron ore to a steel mill. The mill produces steel but I can’t transport it to a factory to make goods? Seems like a missing link here. 1) Bring the coal and iron ore to the steel mill to make steel. 2) Bring the oil to the chemical plant to make plastic pellets. 3) Transport the steel and plastic pellets to the auto factory. 4) Take the finished autos to the automotive rail yard. 5) Load the auto-carrier trucks and take the cars to the dealerships. I find this to be fun and challenging and it seems to be missing here. I hope there are more things to do than simply transport these four items. Your are right and your example is good, but for release keep it simple or not? I know Basil did say that but only 4 items makes the game very limited. I don’t know what is involved in adding these items, I am not a programmer. But there are mods available for Locomotion that are similar to my example and these were created by individuals several years ago, so it can’t be that difficult. I don’t understand why more items are not included in the first release. I don’t think any of us wants this to fail and I want it to be successful and well received. So the guys might want to rethink this. I am very much in favour of the makers’ approach – although I am a big fan of TT or IndustrieGigant. The makers say that the game is more about transporting passengers and about simulating an economy. Simple economic models work usually with only one type of good. The approach taken by the makers is therefore fine as it keeps things simple in the beginning. This might attract also people who do not like to dig that deep but I am sure that it will be still a lot of fun. I am also sure that it will be pretty easy to introduce more goods and intermediate products as at least a longer product chain will not inflict the general economic model of the game. More end products will of course need fine tunning of the economic model – or if simplicity is the top priority it is easily possible to work with arbitrary quotas for certain end products depending for example on the game year. I personally prefer the system the developers presented, it’s simple and with city and economy development also very interesting. For me personally it’s quite unrealistic to find everything you need to build cars within 265 sq km. And not to forget: goods have destinations so it should still be possible to have transportation chains. Hello. I have some questions for the game. 1. They are in the game trolleybuses? 2. They are in the game narrow gauge rail? 3. They are in the game Czech vehicles? 1. Not in release, but in DLC may be. I hope to this. 2. In release, as far I know, will be one rail gauge – 1435mm. 3. Well, if not – modders can do it! We have some Czech vehicles for CiM, so i hope it will not be a big problem. 1. Are you planning to CIM feedback? 2. When plans to release game? 1. Um, what are you mean? 2. Q2 2014. Likely in May. 3. Well, in release exactly will be English and German, about other languages still has no information. 2. Release date has changed. See the newest update (Release in Q3 2014). 3. English, German and Russian at least. More languages may be announced at a later point in time. Are you planning to CIM mods feedback? The addons models are very good from the modeler to CIM. Something addons in the TF would be nice.